On the hillside above the bracken. 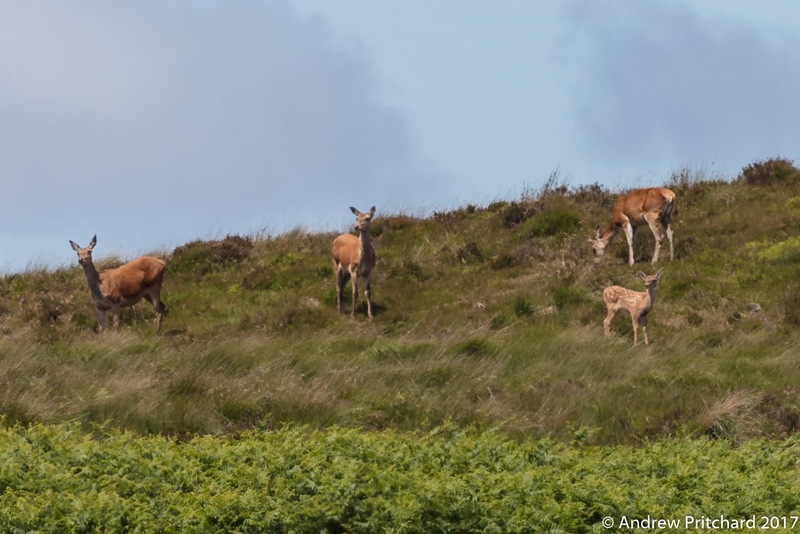 A group of deer with hinds and a growing calf from this year stand in the grass on a hillside above some bracken, looking to their right at something. The deer seem to like the bracken, perhaps as it can provide good cover and grows high and over very large areas, allowing them to travel safely across the moor. 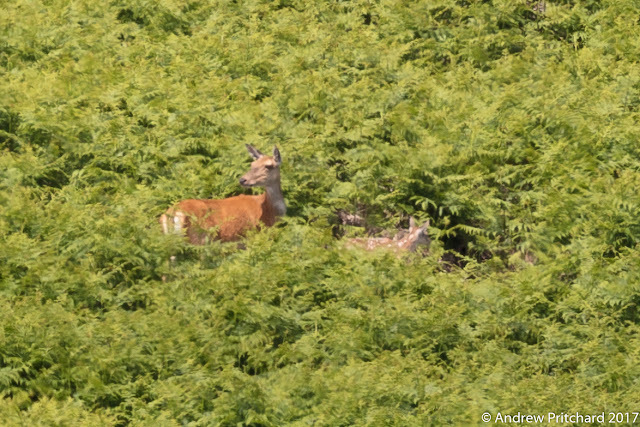 A hind next to a calf in bracken. A hind and a calf stop walking through bracken whilst she looks at something to their right. The bracken is so high even though it is quite early in the growing season, that the calf is almost hidden from view. There are many large areas of bracken on the hillsides on the moor, providing corridors of travel under cover, especially for the smaller herd members. A hind above a calf in bracken. 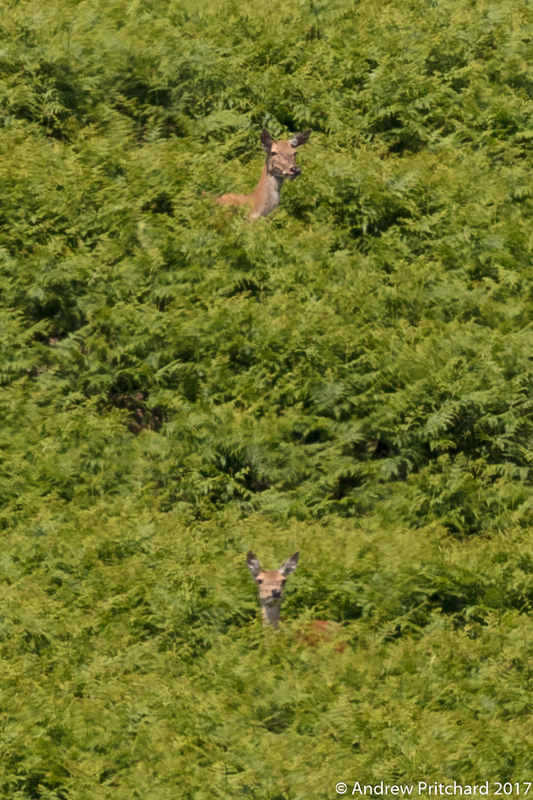 A hind stands in an elevated position above a calf, both looking out from the bracken at something. The height of the bracken obscures everything but their necks and heads. If they were to lie down, perhaps in a grassy clearing in the bracken they could hide from view. The bracken may grow to over two metres later in the year, possibly enough to hide even a large stag. 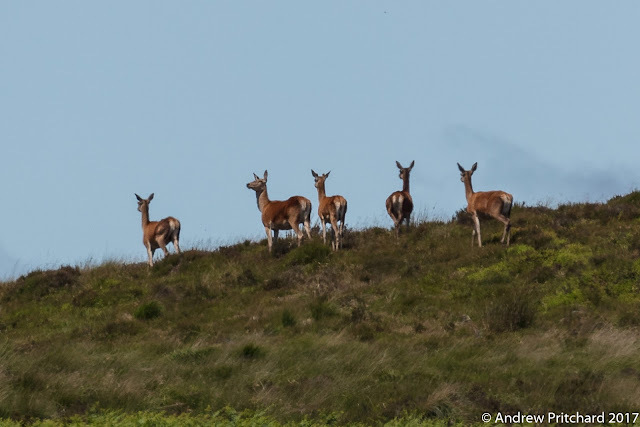 A group of hinds walking on the skyline. A group of hinds walking away over the skyline. Here grass dominates the flora. Bracken prefers a well drained soil so tends to grow on hillsides, rather than tops or boggy valleys. The deer also tend to travel along hillsides, or congregate on them for grazing, so perhaps that is partly why the spend time travelling in the bracken, hidden both by the terrain and the flora. 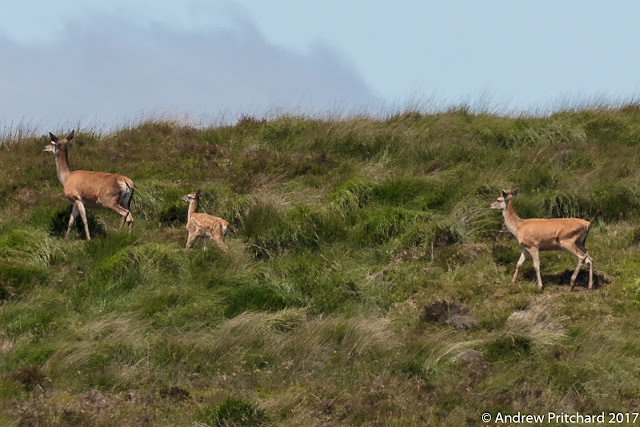 Two hinds and a calf walking diagonally up the hillside. A calf walks diagonally up a grassy hillside in between two hinds. The profile of the calf seems to be similar to that of the hinds, so it may be female, learning how to survive on the moorland with help from it's mother, and other hinds. 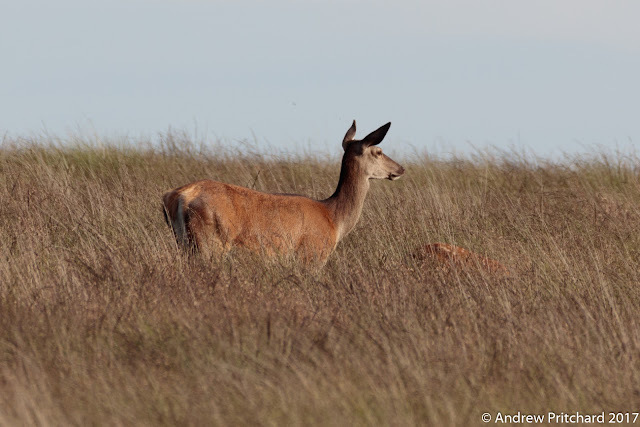 The other hinds are likely to be related to the mother, and could be considered "aunties" of the young calf. 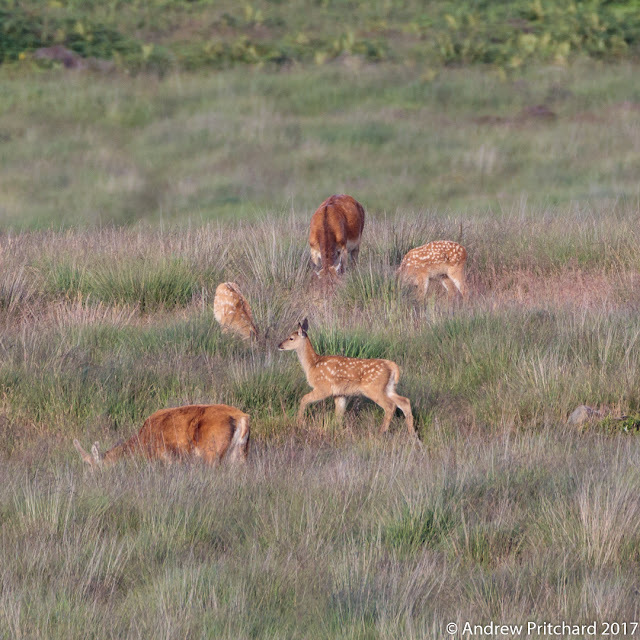 In previous months we saw how the calves tended to rest in what seemed like crèches, with a few hinds watching over them. 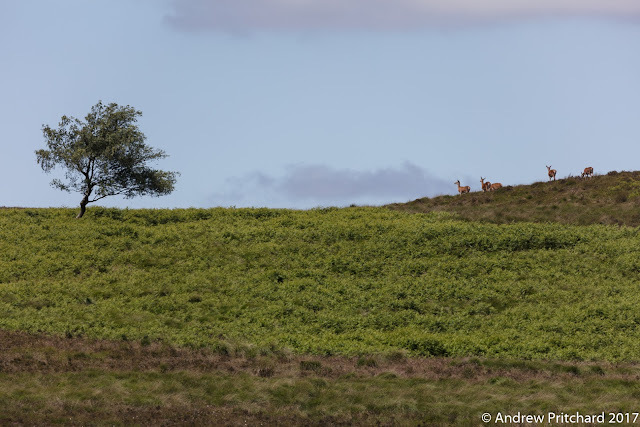 Five hinds walking along the skyline towards a solitary tree. Five hinds walk along a grassy hill top towards a solitary moorland tree. Swathes of bracken can be seen growing on the hillside below them, but they seem to want to travel in the open, perhaps to an area of grazing where there is no bracken corridor access! A young stag stands amid grass and buttercups. 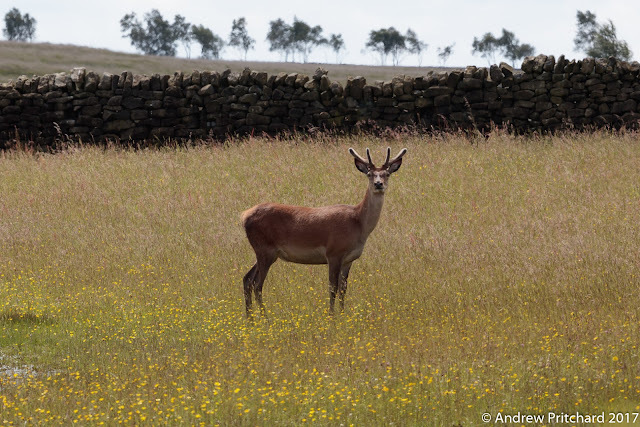 A young stag stands looking towards the camera, his hooves hidden amongst grass and buttercups. This was a favourite haunt of the stags, who seemed to appreciate the meadows next to ample water supply if necessary on hot summer days, plus old dry stone walls to lie behind. All of this month's stag images come from this area - the stags seemed to use this as a quiet place to rest and grow their antlers! Five stags in the grass. A group of five stags stand in the grass field in front of a dry stone wall. In front of them is the edge of the pond. In long spells of dry weather the pond has a tendency to completely dry up, but as can be seen here in some summers there is ample rain to keep it filled. The soon to be rivals at present still seek moral support in each other's company, forming quite a close group. Three stags walking along the edge of a field. 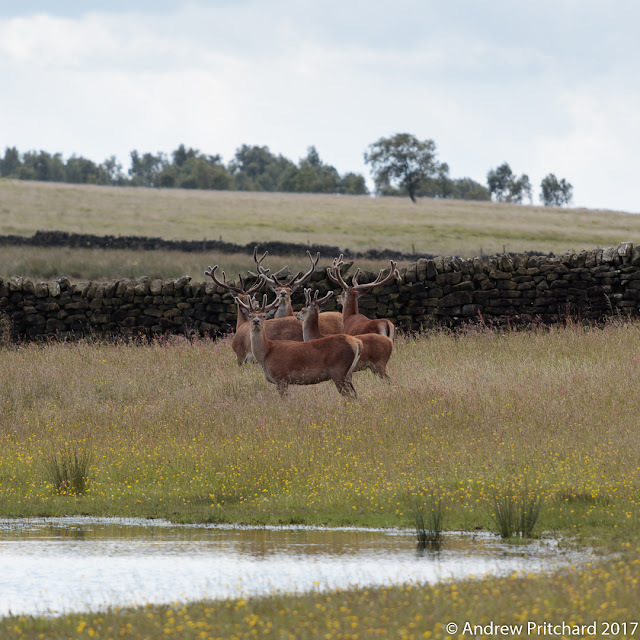 Three stags walk along the edge of a field, in front of a dry stone wall, as if parading their antlers for any one or thing nearby to see. These three all present a fine set, almost fully grown but still covered in velvet. It will soon be time for the velvet to dies and be shed, as the antlers harden in time for the coming rut in September and October. Two sets of antlers poke above a ruined dry stone wall. 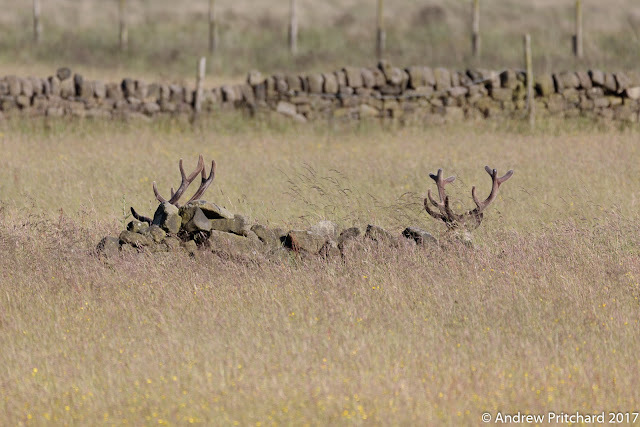 Two stags are lying down behind part of an old ruined dry stone wall, with only their antlers visible. This area near the pond, as shown earlier seems to be a great place to wander in small groups, mostly undisturbed yet quite close to human paths and even a farm. There is ample grazing, and old dry stone walls to lie down by and chew the cud. They don't realise though that their antlers are visible over the tops of the wall though! A stag tilts his head far to his left, almost looking backwards. In front of him is an old tumbled down dry stone wall. As he turns his head, fine detail in the velvet covering his antlers can be seen. The velvet supplies blood and nutrients to the growing bone, and must also grow as the antlers grow, perhaps causing the grain-like patterning seen here. You've got to scratch it. 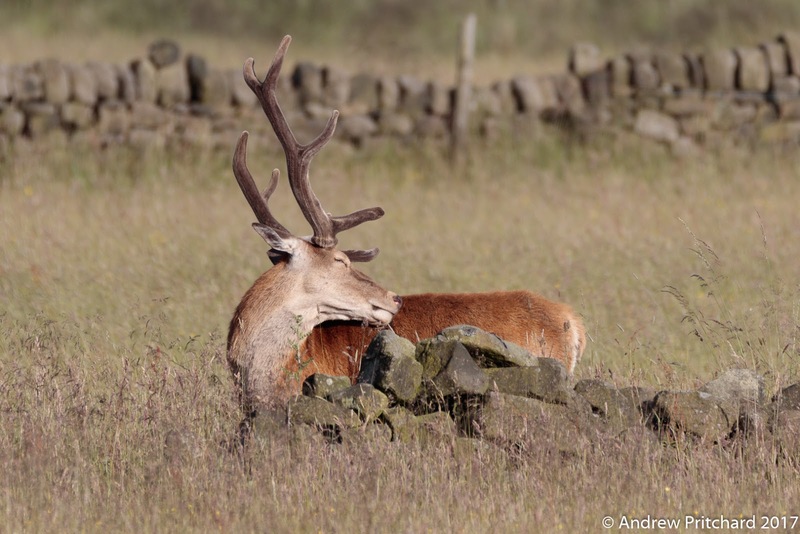 A stag contorts to his left to nibble at his flank, something must be irritating him. 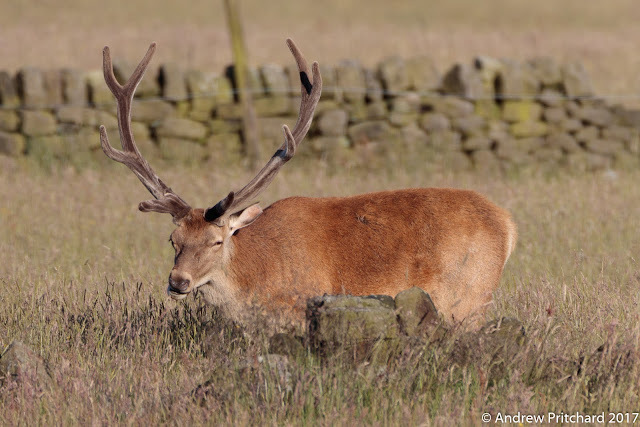 It is known that red deer carry parasites, one if which can be the tick, which attaches itself by burrowing its mouth parts into the skin and feeding on blood. This must be quite irritating, but the tick will usually drop off once fully fed. 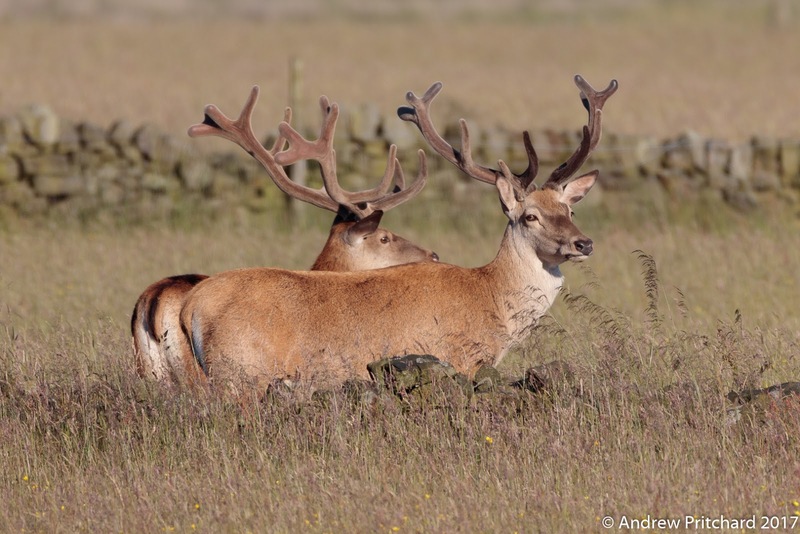 The antlers on this stag have rounded ends, which indicate they are still growing. This is going to a fine set once fully grown, at least fourteen tines which would make this stag a monarch or imperial. The monarch of the moor perhaps! Three stags grazing between old stone walls. 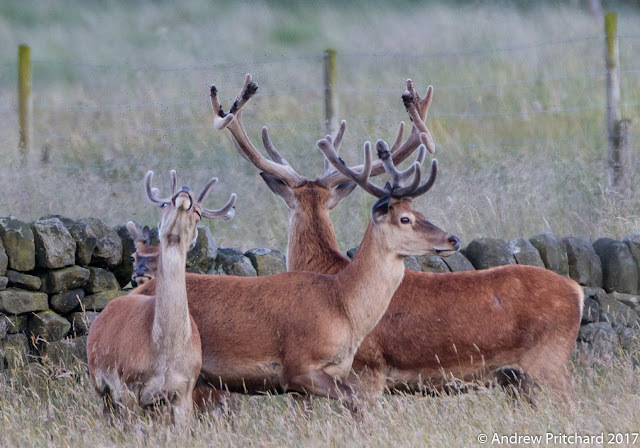 Three stags have their heads down, with antlers poking up whilst they graze. They are in between two old dry stone walls, the wall in the foreground being in a bad state of repair. Growing antlers must be a hungry business - these stags seem to graze, rest and ruminate in a continuous rotation. Four stags grazing and chewing. Four stags are grazing in between two dry stone walls, two with heads down, two with heads up. The two stags to the right of the image seem like impressive fellows, both in terms of size and antler growth, and both with rounded ends to some of their tines, indicating even more antler growth to come. Two stags taking a break from grazing. Two stags displaying their developing antlers, whilst taking a break from grazing. These two again have the rounded ends to their tines, both looking almost as equally impressive as the other. They have a very reindeer like appearance at this time with the rounded antler ends, but will very soon begin to look more fearsome as the antlers become pointed and white tipped. 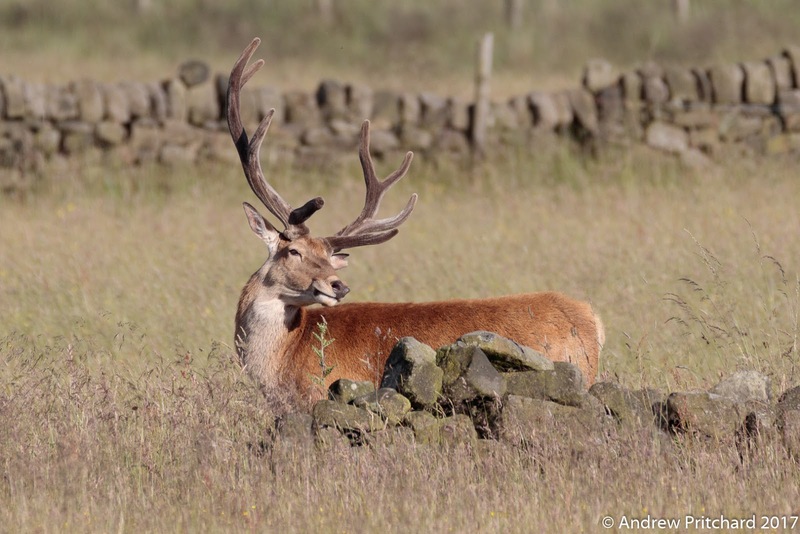 A stag chews grass behind an old dry stone wall. 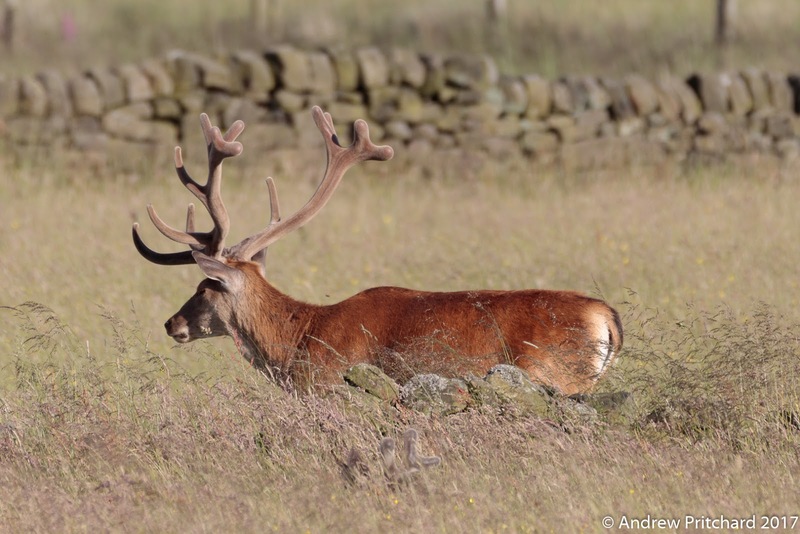 A stags has his head up displaying his velvet covered antlers as he chews grass behind an old dry stone wall. The antlers on this one appear to be sharpening up - it won't be long until the velvet starts to be shed and soon after that the stag is ready for action in the rut! Some pictures later this month will show the beginnings of the death of the velvet. 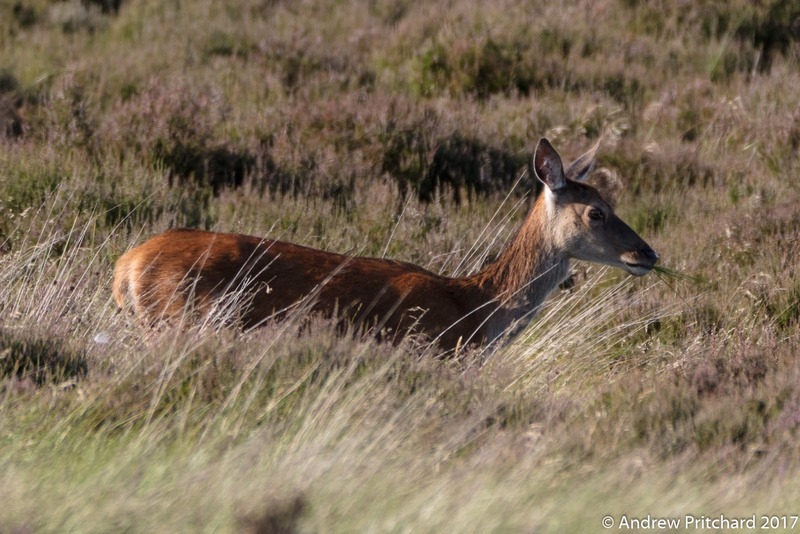 A hind chewing some heather. Elsewhere higher on the moorland there are large groups of hinds and calves, both new born, yearlings and older. A hind here is standing in heather in the action of chewing on a piece of the heather, which one imagines can be quite tough! 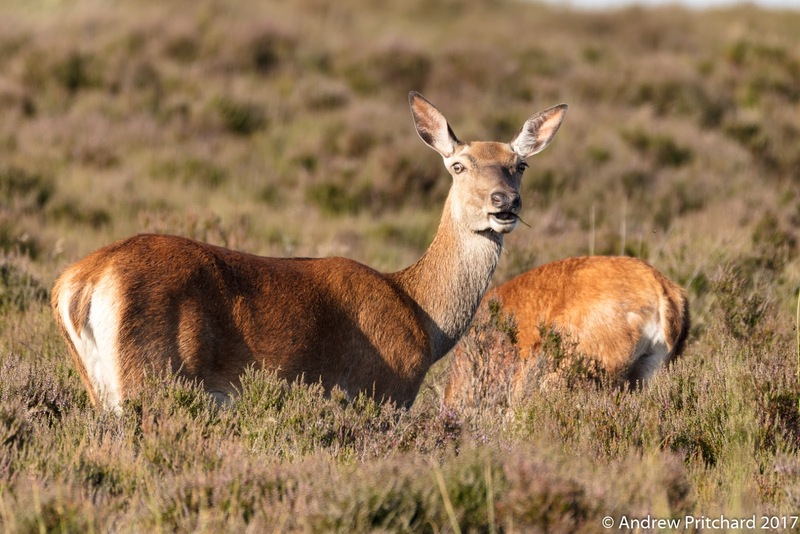 It would be interesting to note if the deer eat the heather when it is bloom in August, when it must be a lot more fragrant and sweet tasting. A young hind chewing some grass. With the same group of hinds and others, a young hind has some grass sticking out of her mouth as she chews it. Perhaps the younger deer prefer slightly easier to chew moorland grass, than the tougher heather that the older hinds seem to eat. There is plenty of both on the moorland, which is not managed for grouse shooting so the range of heather growth is more limited than it otherwise could be. Three stags irritated by flies. 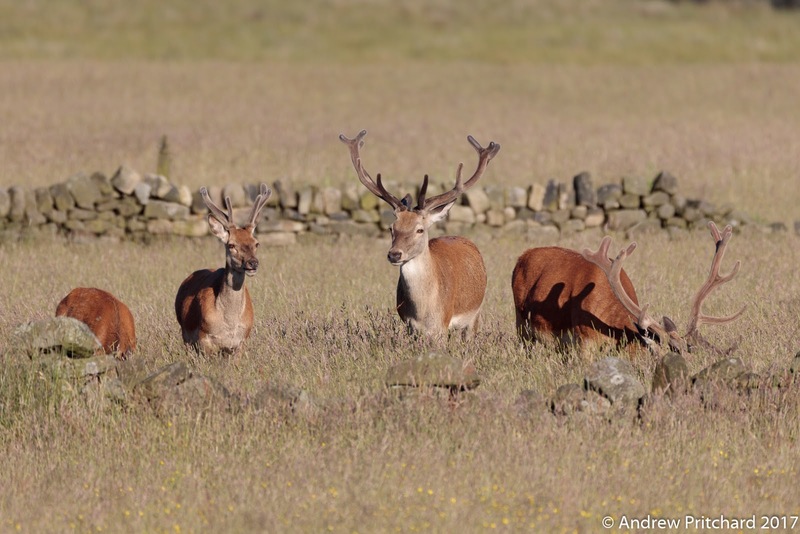 Three stags are irritated by flies clustered on the tines of their antlers. It becomes clear now how the beginning of the end of antler velvet arrives. Small areas must begin to shed, so exposing wet bloody tissue underneath which seems to be very attractive to flies. The moorlands and nearby fields are full of insect life, which can be a boon for the birdlife but is clearly as irritating for deer as it can be for humans! 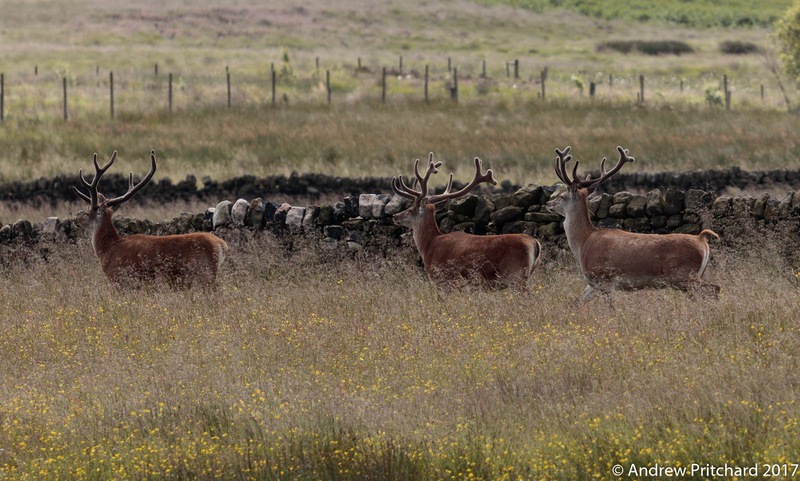 Three stags walking in front of a dry stone wall. Three stags are walking in front of a dry stone wall, all showing antlers at different stages. One seems to have shed much of the velvet already, with nicely pointed tines at the front. In the middle the largest set of antlers still appears infested with flies, and some roundedness to the ends of the tines, although I doubt that they will grow much more. The smallest stag also has the smallest antlers, and no flies to be seen! A hind standing in tall grass, with ears pricked looking to the left. 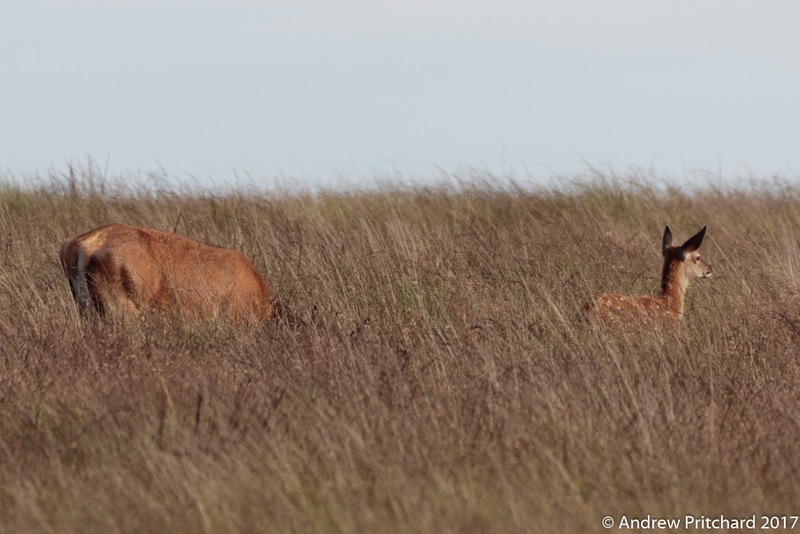 A hind is standing in the moorland grass, with her calf next to her. She has her head up, with ears pricked, whilst the calf has its head down, with only it's back visible. The white spots on the calf's back are clearly visible, though lying down in the tall grass the calf would be impossible to see unless an elevated position was available. A calf is looking with ears pricked to the left, whilst its mother has her head down in the grass. Now the calf is looking with ears pricked at something to its left, whilst it's mother unconcernedly continues grazing with her head down. The natural alertness of the deer often means at least one pair of eyes if scanning the surroundings for any threats. It only takes one to notice something, make an alarm call then many more heads would be raised. A large group of hinds and calves grazing at the base of the edge behind them. A large group of hinds and calves grazing on the grasslands in front of the edge behind them, near to the woods where many of the calves were probably birthed. This area is usually well away from any human incursions into the local environment, but with well trodden footpaths passing quite close by. The deer are unconcerned with distant human presences, and a solitary human walking slowly and carefully can get reasonably close to them. Two hinds and two calves grazing, with another calf walking through their midst. Two hinds and two calves are grazing on grass as another calf walks through their midst. Barely two months old and this year's calves are already growing well, and grazing on their own. Bodies seem to grow faster than heads however, with large legs and flanks looking outsized compared to the smaller heads.